The following article, written by Steve Woods, is part of an ongoing series that focuses on a select topic of inspiration for the month. The focus for October is “Explore”. 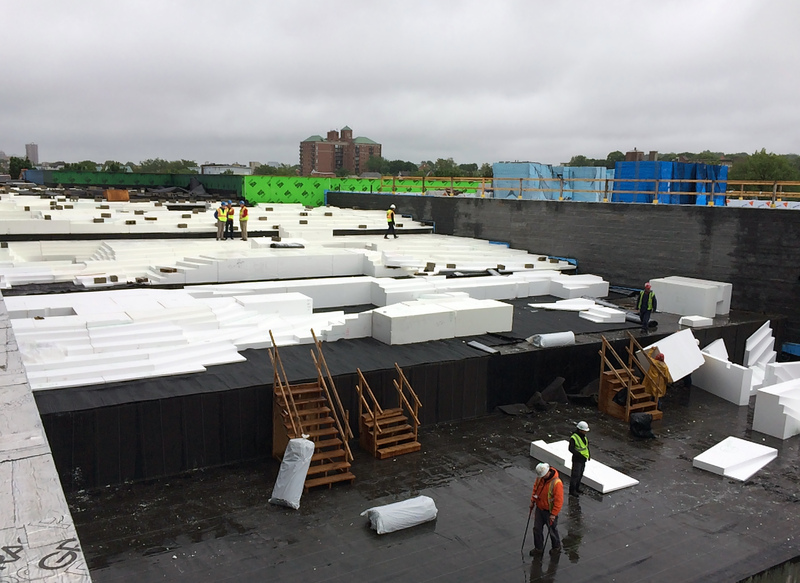 The New Balance World Headquarters at Boston Landing provided CRJA-IBI Group with an opportunity to explore and advance the use of rigid insulation (Geofoam) in the sculpting of its iconic rolling landscape. 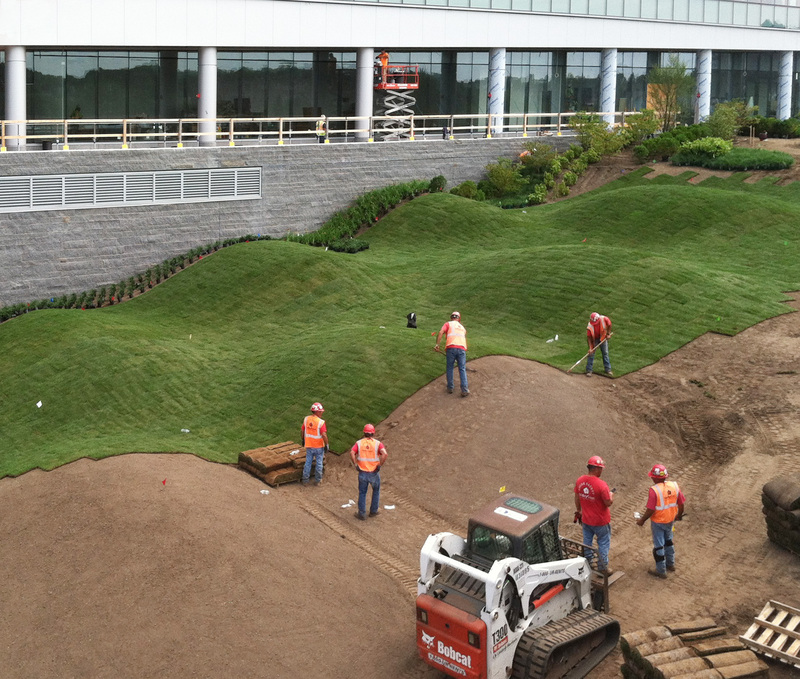 The transition of green between the arrival plaza and the podium terrace is comprised of lawn and planting, all of which cover the structural ramp transitions of the parking garage below its surface. Given the nature of the parking garage below, loading limitations were placed on what could occur on top of the structure. 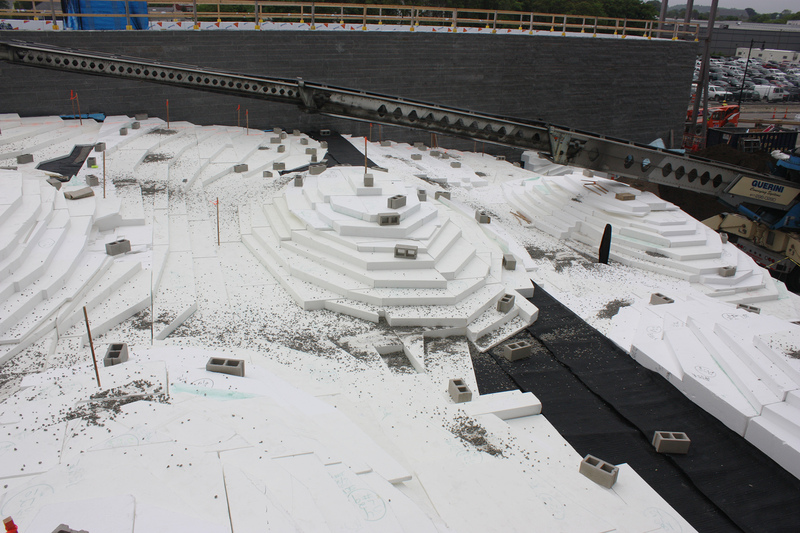 Understanding the loading limitations, the creation of the sculptural forms required the use of rigid Geofoam made of expanded polystyrene to develop an average profile of 12” of soil to support the lawn. Deeper pockets we formed in the foam area to support planting of trees and shrubs. 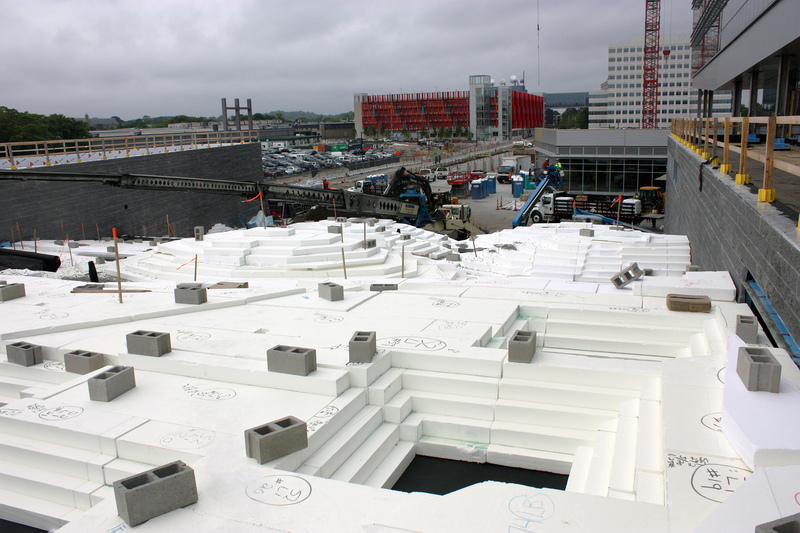 Detailed grading and sculpting plans and shop drawings were developed to guide the Geofoam manufacturer in piecing, cutting and creating the lego-like 3D forms, mimicking the final graded land above. 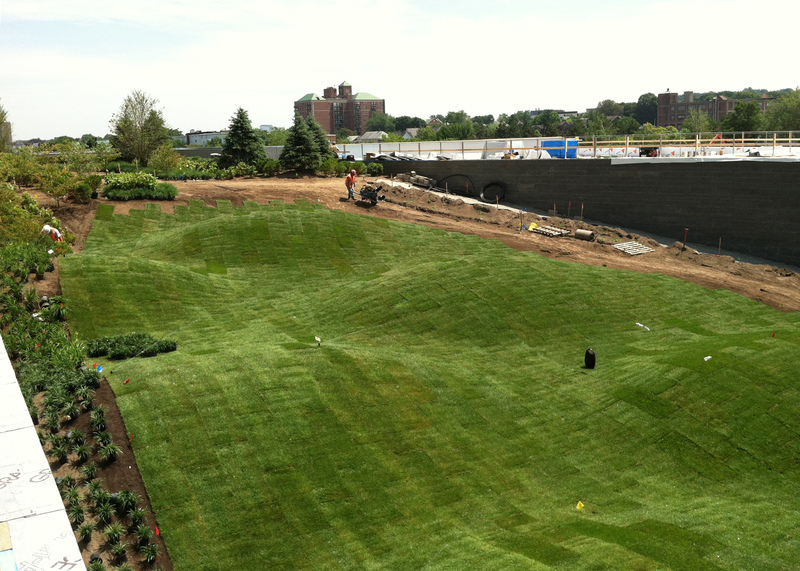 In the low points of the valleys between the mounds, express drainage ways were provided to move excess water below the surface to building drainage below. Conceptually, inspiration for all forms and spaces was drawn from movement; the shape, form, action, and reaction of movement. 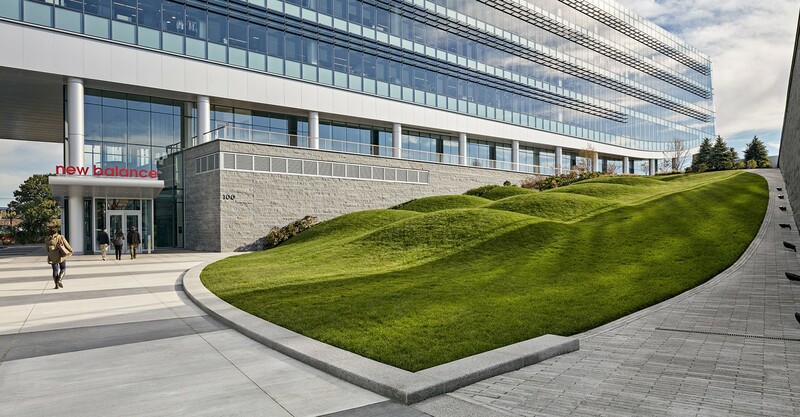 An abstraction of this movement angle is ever present in the site design, along with the sculptural rolling wave form resulted in the “mounds” rising up the lawn slope. 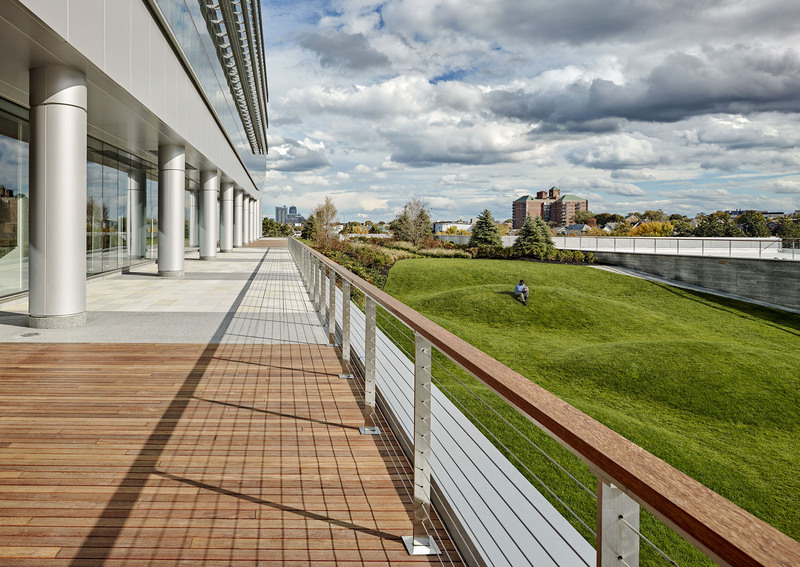 The result is a unique site expression and front door to the new headquarters, offering a variety of uses to the staff of New Balance and the broader Allston / Brighton community. 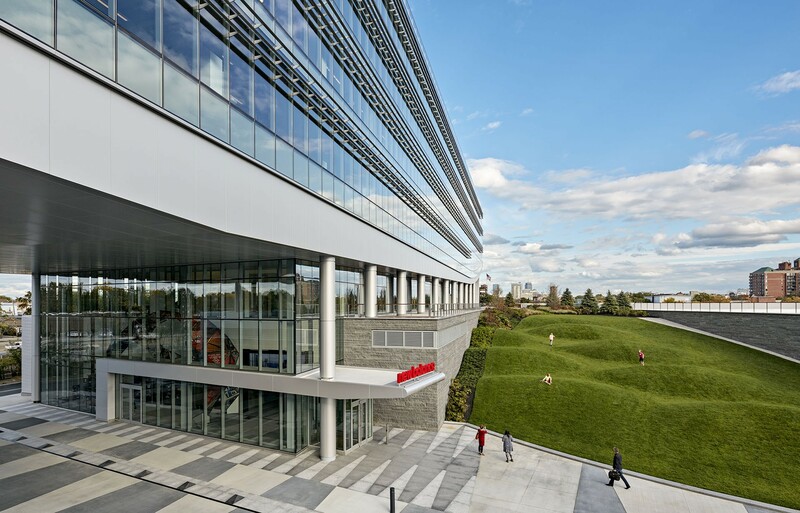 Impromptu meetings, morning boot camp workouts, and kids at play have enjoyed the space throughout all seasons. Yoga at Dusk in full swing with @megrozanski @djsprino and @boston_wellness! Join Kate & Kerri from @otfbrighton on September 22nd for #SweatNStyle, a dynamic outdoor workout featuring music by @DJSprino. Enjoy 20% off at @NB_FlagshipBos at 5pm, the free workout at 5:45 and then head to @RailStopBoston afterwards to celebrate! Reserve your spot here using the link in our bio.